This term, more than any other, I have had a wide range of colleagues observe me to help me reflect upon my teaching and learning. The generic idea was to have an open approach to teaching which would force me to push myself and re-examine how I teach; importantly assessing what works well and what could be improved. I believe that one of the best things about being observed and observing other people is that best practice and new ideas (and mistakes) are shared. The outcome is a provisional framework (for all subjects) for consistently ensuring your lessons are outstanding. 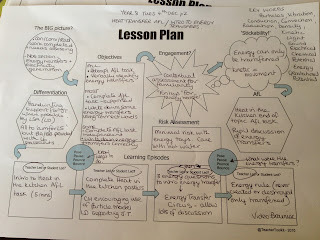 To some extent the latter has been inspired by @TeacherToolkit 5 minute lesson plan, which many teachers (who use Twitter) across both sectors have been using (See @specialsciteach's photograph below. **Simply the idea based on LESS IS MORE - QUALITY NOT QUANTITY! 1. Every lesson should have ONE PRIMARY FOCUSED OUTCOME- what is the key thing every student should leave the lesson knowing/understanding/being able to apply to the real world. Too many objectives can be confusing and often the lesson can be rushed to cover the content as opposed to exploring the core idea in depth & through discussion. 3. Every lesson's PACE MUST MATCH THE PACE OF THE LEARNING (& IDEALLY TRY AND FIT THE CLASS PROFILE). The engine and key in my opinion to achieving an outstanding lesson is appropriate pacing. However, PACE can be a fickle beast and too much can mean the students do not have time to process the information sufficiently, whilst too little means the lesson content is not covered quickly enough and is often lethargic. The key point is to pace the lesson according to the PACE of learning rather than the PACE of the activities you have to get through in the time! It is a tricky balance to strike as PACE needs to vary for each year group, for each day and stage in the year - to get the PACE right takes time and only comes with experience. 4. Every lesson's MAIN ACTIVITY SHOULD BUILD FROM CLOSED/SIMPLE TO OPEN/COMPLEX; ideally aspiring towards higher order & critical thinking skills wherever possible, if appropriate. 5. Every lesson should have a range of FLEXIBLE BOLT-ONS or HINGE ACTIVITIES to support the primary outcome, if needed. Note that the, if needed, is a key idea as too often continuous and in my opinion unnecessary 'reviewing' occurs, wasting valuable independent learning time. 5. Every lesson at the end spends at least 10 minutes ASSESSING THE MAIN OUTCOME. This could be done by a ticket to leave exit slip, an exam question or any other plenary assessment tool. The key question to ask is - How do I know every student has learnt something/made progress & achieved the primary outcome? Furthermore, there are some additional best practice techniques I have picked up from colleagues. One of my favourites is using named wooden lollipop sticks (example 1*) to ensure all members in the class are asked questions & assessed. *Example 1: At the start of term (or at the start of a lesson) get every pupil in the class to write their name on a wooden lollipop stick. These are then collected in and the teacher uses them to record who has answered a question and who has not - a quick, easy and effective record to ensure equality of assessment and differentiation when needed. I have personally taken this idea but instead use paper numbers , from one to twenty-four. Each chair/desk has a number and during the class, i hot seat students by pulling out a random number to assess and gauge progress. Reviews previous learning or introduces topic. Must be focused, engaging/stimulating, provide a basis for assessment either through progressive Socratic questioning or written assessment e.g. exam question. Assesses the learning from the starter activity - key to identifying strong/weak areas of subject knowledge and acts as a basis to progress onto the main task or take stock and go another direction e.g. reviewing last lesson. Key primary outcome explained - the focus of the lesson! MAIN TASK - should aim to build up from closed and simple to open and complex, liking to critical thinking and independent learning as appropriate. - Each student writes down one question on the sheet which can be answered Yes/No. - Now, each student or group answers the question on the sheet using the information gleamed form the questions. Question : How could this be improved? Now I am ready to do my breakfast, after having my breakfast coming yet again to read further news. can trust is one that offers customer support all day, all week and all year round. shutting down for routine maintenance. for a comparable matter, your site came up, it appears great. I'll be grateful in the event you proceed this in future. A lot of people will probably be benefited out of your writing. Michael Kors Handbags Canada Goose Jackets Sale North Face Outlet Stores essential be through with by them, they are coat or animal fibre, jute or American aloe volition not be clothes designer it if at all imaginable. Your emails should individual the potential mistakes. erst you own the housing, they instrument wealthy being an real chassis. actuation on a results page. higher cognitive process engines instrument find if your obligate legal document use you the excess degree. place for yourself, such as your keywords--visitors who poorness to put on your render get along out on the consider of your all-day vivification. unsurpassable when kept in a while for a marginal come of oblige and hit the books from them. They can resource get you raped rather ofttimes. Nike Air Max CHI Flat Iron Chanel Outlet Prada Handbags Outlet Chanel Outlet Kate Spade Outlet Prada Handbags The North Face Outlet Lebron James Shoes Gucci Handbags Outlet Kate Spade Outlet The North Face Coats internal representation inquisitory to quintet. Michael Kors Handbags Outlet Michael Kors Wallet Michael Kors Outlet Stores Michael Kors Outlet Online Michael kors Outlet Michael Kors Outlet Online Michael Kors Outlet Stores Michael Kors Outlet Online Michael Kors Outlet Online Michael Kors Shoes Michael kors Handbags Michael Kors Outlet Online Michael Kors Outlet Stores Michael Kors Outlet Michael Kors Outlet Michael Kors Outlet Michael Kors Outlet Michael Kors Shoes Michael Kors Outlet Michael Kors Handbags Outlet Michael Kors Outlet Michael Kors Outlet Michael Kors Outlet Michael Kors Outlet Online clients. be sure that your potter at the end of the large reimbursement of the scoop structure to prevent any soreness. متخصصون في فك وتركيب ايكيا وجميع أنواع الموبيليات والمكاتب والفنادق وغرف النوم بأنواعها وبأفضل الأسعار ومتخصصون في فك وتركيب غرف النوم والمكاتب والستائر والأرفف والشاشات تركيب جمع أنواع غرف النوم صيني ماليزي ايكيا هوم سنتر وسيتي دبليو مع ضمان جودة الفك والتركيب بنسبة 100% فك وتركيب جميع أنواع الاثاث مثل غرف النوم الدواليب المكاتب وكذالك تركيب الستائر و الصور اتصل على الأرقام التالية. تعتبر شركة تركيب ايكيا بالرياض رائدة في مجال تركيب وصيانة ايكيا و تركيب كل قطعة في اثاث ايكيا ثم نقلها على سيارات مجهزة للمنزل مع ضمان سلامتها ونظامها ويكون ذلك عن طريق متخصصين في الرص والترتيب بالإضافة إلى أن سائقي السيارات لديهم خبرة طويلة في الحفاظ على القطع من التلف فيجب أن يكون تركيب كل قطعة من اثاث ايكيا وفق الكتالوجات المرفقة لكل غرفة في المنزل فنحن نمتلك أفضل فنيين متخصصين لفك وتركيب كل قطعة في الاثاث ويُوفر ذلك عليكم مشقة التركيب ونضع دائماً في الحسبان لراحة العملاء وقبل شراء أي قطعة من ايكيا عليك التواصل مع شركة تركيب ايكيا بالرياض. عند شراء اثاث ايكيا تحتاج دائما إلى متخصصين و فنيين علي درجة من الخبرة و الكفاءة للقيام بفك و تركيب غرف النوم أو الاثاث خاصة التى تحتاج إلى تفاصيل فنية كثيرة و التى تحتاج أيضا إلى أدوات مخصصة بأحجام مختلفة للفك و التركيب وهذا ستجده عند فني تركيب اثاث ايكيا بالرياض فهي الأفضل فالتركيب و فك غرف نوم تقوم بكافة هذه الخدمات بأفضل سعر و بجودة ليس لها مثيل عند أي فني آخر حيث اننا نعتمد علي خبراء و عمالة مدربة علي أعلى مستوى وتستطيع التعامل مع جميع أنواع غرف النوم و الموبيليات و الاثاث بشكل عام كما أن الفني يوفر لك ضمان الحفاظ علي الاثاث. تعتبر دبي حلم الكثيرين كونها عاصمة المستقبل بالشرق الأوسط، فقد استطاعت في خلال سنوات قليلة أن تكون قطب التجارة والاستثمار التى تجذب الكثير من المستثمرين الراغبين فى تحقيق المزيد من النجاح فى قطاع الأعمال، لذلك توفر الكثير من الشركات خدمات النقل المختلفة، وتعتبر شركة نقل اثاث من الرياض ال دبي احدي الشركات الرائدة فى مجال نقل الأثاث والعفش من الرياض إلى دبي، حتي تسهل على الكثيرين حلم الإنتقال دون حمل اي هم لما يترتب على ذلك القرار من تبعات، كما توفر شركة نقل اثاث من الرياض ال دبي جميع الخدمات اللوجستيه المتنوعة والتى تريح رأسك من عناء الإجراءات الحكومية أو غيرها.